The man who has been reporting news and weddings in Fako Division for Fako News Centre, Stephen Mokondo Moki, was himself the centre of attraction when he married Lydia Enjema Njie on 21 December 2012 (council signing) and Saturday 29 December (church wedding). Stephen Mokondo Moki who hails from Ekona Mbenge village but grew up in Ewonda village in Buea, and Lydia Enjema Njie who hails from Mokunda village in Buea, were a perfect match. 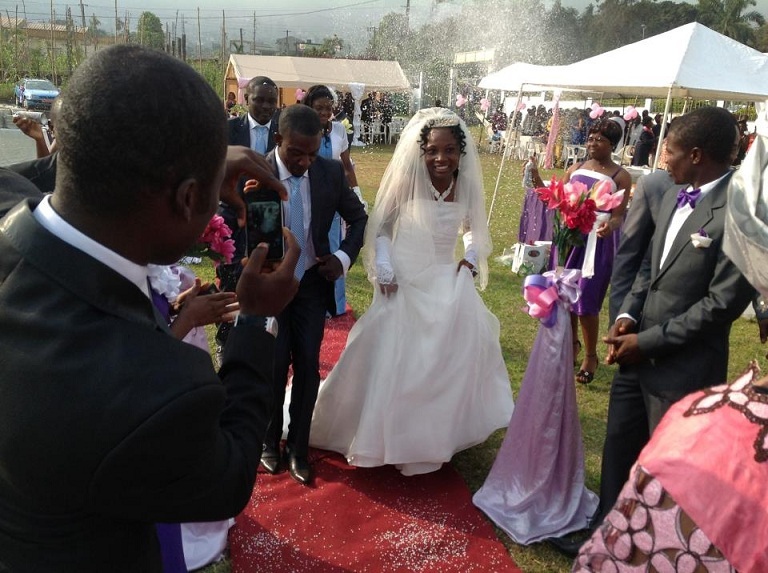 Their church wedding brought together family and friends- some of whom travelled from far-away towns and cities in Cameroon, Africa, Europe and North America especially for the event. Fako UK, owners of Fako News Centre, were well represented at the event by some of their members who had travelled to Cameroon. The masters of ceremony of the event were Matute Menyoli and Nicholas Egbe, both of CRTV Buea. The chairperson was none other than Dorothy Mojoko Ewusi-Ngoh from the USA, whose presence at happy events adds more sunshine and glamour. The compound of IVTC (International Vocational Training Centre) Buea, was the venue for the reception after the church ceremony. Guests were entertained by Tata Kinge and others, whose music and dancing stimulated the hormones that bring joy and happiness to the human body. The dishes that were prepared were a master class of Cameroonian cuisine. It was the perfect weekend for such an event- the long weekend between Christmas and new year as Monday, the day before new year, was a public holiday. AS THE SAYING GOES, PICTURES TELL THE WHOLE STORY. CLICK ON THE LINK BELOW AND GO STRAIGHT TO THE WEDDING ALBUM AND VIEW THE PICTURES.